The Business Problem: You’re a designer, engineer, architect, musician, writer or another type of professional who needs to have prospective clients sign an NDA prior to viewing certain work samples or information. The Fresh Solution: VisualCV + EchoSign Accelerate the Process! 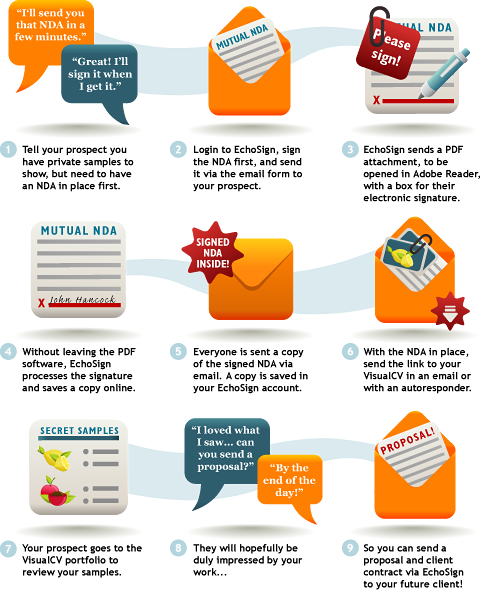 EchoSign is an effective way to have documents (like an NDA) signed electronically. The cost is free for 5 signatures a month, with Pro, Team & Enterprise plans available that range from $12.95 to $299 per month. You simply prepare your documents in Microsoft Word, Excel, WordPerfect, Text or PDF, upload, and send them via an email form to one or more people. When all the signatures are collected, EchoSign will send copies to everyone as well as save a copy in your online account. A pretty valuable service, for businesses of all sizes… in fact, it’s even integrated into Salesforce so sales folks can close deals more quickly. • When you get the email receipt for the signed NDA, log into visualcv.com and “Share” it to send an email to your prospect that will contain a secure link to your VisualCV. Get the tools and let me know what you think!